"Marred by Lewd Laughs and Language"
HEAD FULL OF HONEY follows the Alzheimer’s afflicted mind of Amadeus, as his loving granddaughter attempts to help him remember that he has purpose by taking him on a trip to Venice, where he first met his wife many years ago. 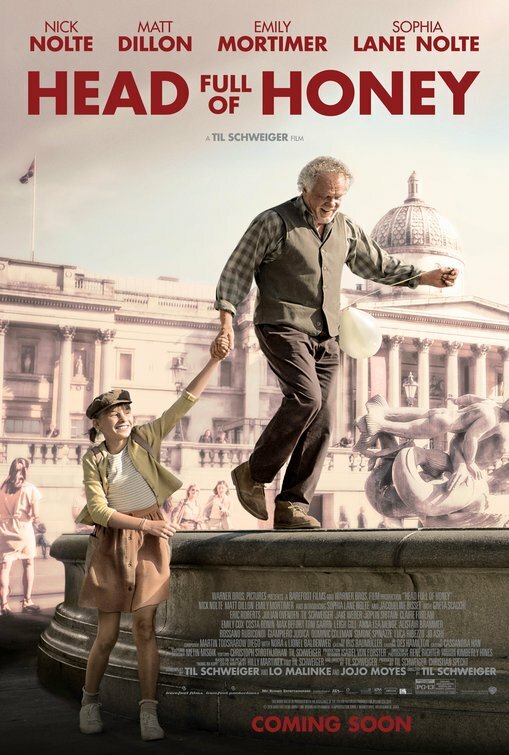 HEAD FULL OF HONEY follows the Alzheimer’s afflicted mind of Amadeus, as his loving granddaughter tries to help him remember that he has purpose by taking him on a trip to Venice, where he first met his wife many years ago. After his wife’s death, Amadeus relocates from Connecticut to England when his son believes he can’t take care of himself. He’s beginning to have signs of dementia and Alzheimer’s Disease. Tasks that once seemed quite simple are now turning into a complete disaster very quickly. Trying to make Amadeus useful, his son’s wife first assigns him the task of trimming the rose bushes in their yard. She comes home to find her roses demolished, and the bushes hacked down to a nub. A few days later, she comes home to find Amadeus baking a pie, which has caught fire and began to spread throughout the kitchen. The family is already on edge with hectic and demanding work schedules, as well as dealing with the recent affairs of both husband and wife. Ten-year-old Tilda lies to her parents to protect a mistake by Amadeus. So, Tilda’s father decides he needs to be put in a home, to be constantly looked after by someone. However, Tilda has been quickly bonding with her grandfather and isn’t going to be quick to part with him. She does her own research about what helps people like her grandfather in his condition. She tries a few things like playing music that might trigger a memory, but she finally decides that what he really needs is to be given a purpose again. One day, Tilda wakes her grandfather up and tells him they are going to Venice. They hijack the family car, and, after hitting almost everything in their path, they make it to the train station. Tilda uses Amadeus’ credit card to purchase their tickets and they’re on their way. They are now embarking on what will be a wild last adventure for the duo, with Amadeus wandering off, sleeping in a bathroom and hiding in a truck with some sheep. Tilda’s parents report their absence to the police, but when they realize that nothing will be done, they decide to go to Venice themselves to find them. HEAD FULL OF HONEY is a heartfelt tale about the endearing relationship of a crazy grandfather and his adoring granddaughter. The characters learn a great deal about the importance of family, love and sacrifice. There are many very comedic moments, revolving around the trouble that Amadeus gets himself into. However, the production of this movie has quite a few flaws, with audio not lining up with an actor’s lips, and a lead actress that hasn’t quite learned to be comfortable on camera. The story, although full of heart, could have easily been cut short by about half an hour, with many shots that ran on for an unnecessary length of time. Besides these things, there is also a strong amount of questionable content, with plenty of family dysfunction and bad role models throughout. This movie also contains a lot of sexual content, including many inappropriate comments and jokes made by the grandfather. Because of these elements, as well as a primarily romantic worldview, Movieguide recommends extreme caution for young teens and children. Strong miscellaneous content, many examples of family dysfunction throughout the movie as both parents have had affairs and their daughter is fully aware of them, daughter is mildly disrespectful to her parents, disobeys them and lies to them in order to do what she wants, multiple examples of lying and deception, examples of bad role models. After the death of his wife, Amadeus goes to live with his son and his family in HEAD FULL OF HONEY. He’s losing his memory and is unable to perform basic tasks, driving his son’s wife to anger. The family is also dealing with affairs on both sides. The 10-year-old daughter, Tilda, decides to try to help her grandpa remember things that he has forgotten. She decides to take him to Venice, Italy, where he met his wife years before, to heal him inside. Amadeus is played by Nick Nolte, with his on-screen granddaughter played by his real-life daughter, Sophie Lane Nolte. There are very sweet moments shared by the grandfather and granddaughter. However, there are a few production issues, including basic audio problems and a screenplay that could have been trimmed. There is also a high amount of questionable content throughout the movie, with many sexual comments and innuendos, as well as infidelity by both parents, and a lot of family dysfunction. So although there are moments that will pull on the heart strings of the audience, Movieguide advises extreme caution.